As post-production progresses on the movie, this 'Coming Soon' poster was used to promote the film. ‘Multi-talented South African Musician ‘LadyAxe’ presents the music video for ‘The Invitation’, which is the official song from the upcoming horror movie ‘The Ghosts of Crowley Hall’. Directed by herself, the video was shot entirely on location in South Africa, with various clips from the movie being added in later. The song was written and performed by LadyAxe, and is a personal interpretation of the nightmares that lay in wait at Crowley Hall. Ghost Hunter Arron Kasady talks about his investigation into the Paranormal Activity at Crowley Hall. This video clip was released on the internet 21st August 2007 to promote the investigation and documentary. 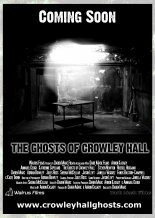 Arron Kasady promotes the official website and MySpace page for the upcoming movie 'The Ghosts of Crowley Hall'. These Ghost Photos were taken during a Paranormal Investigation at Crowley Hall, England in April 2007. This was part of larger Investigation into the Ghosts of Crowley Hall. Visit the site for more information. 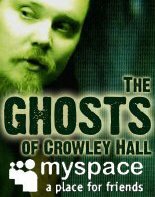 During a paranormal investigation at Crowley Hall in May 2007, this video clip was taken.